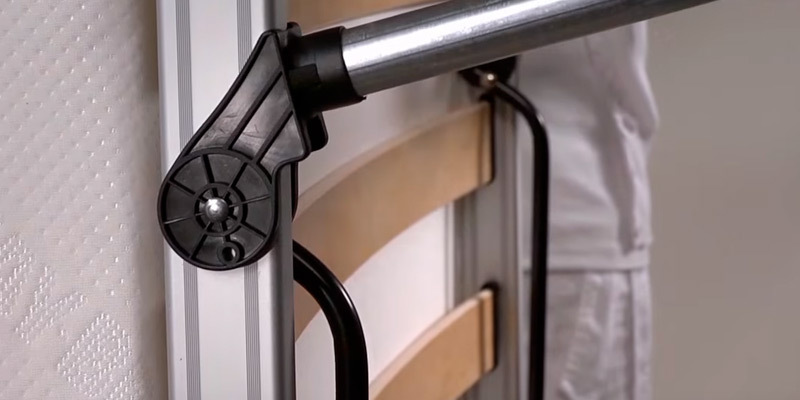 The folding bed is designed with the exclusive J-Lok® mechanism for easy folding and unfolding. Lightweight anodised aluminium frame ensures effortless moving around. A headboard is rather narrow. Made of high-quality materials, durable, and extra comfy, this is the best folding bed you can find around. Backed with a lifetime warranty, it'll serve you for years to come. Due to the convertible threefold construction the mattress here can act as a chair and a sleeping place. The manufacturer offers this bed in several colour options and sizes to suit your interior the best. Too bulky when folded as a chair. 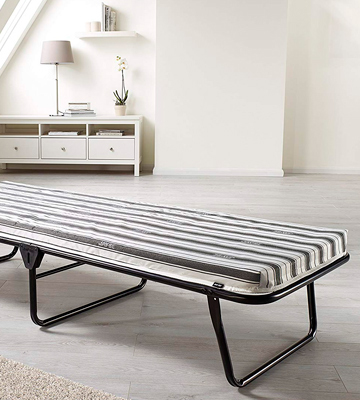 For anyone looking for a compact folding bed to use in small living rooms or nurseries, this one will be a perfect it. It will also come to help when camping, travelling or just having a picnic in your backyard. A durable and solid construction with the lifetime warranty. Takes up minimum space when folded and fits into a car boot perfectly. A quite thin but still comfortable mattress. 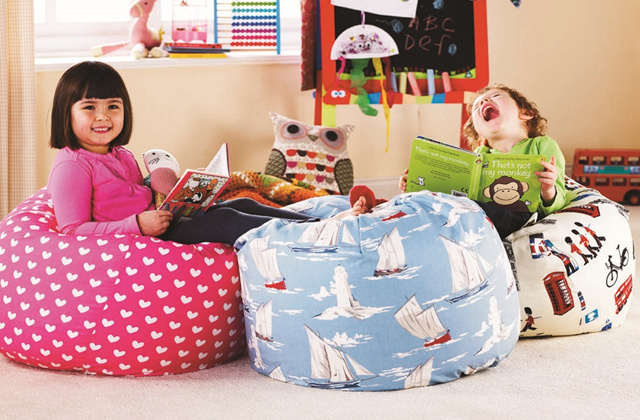 The Jay-Be folding bed is a nice and budget-friendly option suitable for all occasions. It's well built, easy to fold, and sturdy enough, making it a good fit for most anyone. The mattress boasts the Micro Pocket Spring technology. It has over 400 individual springs topped with sumptuous fillings that adapt to the shape of your body. Tall users (180cm+ ) might find the bed a little too short. This is a premium extra bed that will come in handy when guests come to stay at your place. So, if you want to treat them to a luxurious night’s sleep, choose this. Has got a wide headboard and a solid base for users' comfort. 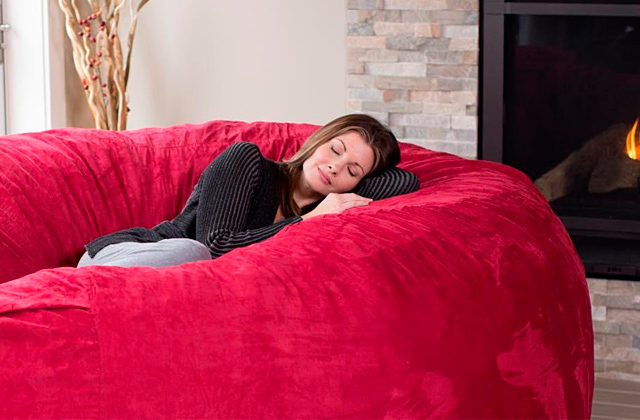 Comes with a mattress, so you only need to grab a pillow. 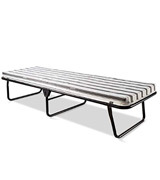 A sprung slatted base might seem too hard for some sleepers yet it ensures excellent back support. 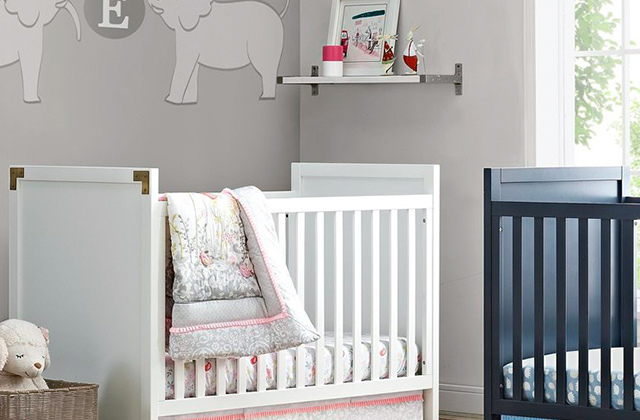 Whether you often have overnight guests or stay a lot yourself in a summer house, you definitely need an extra sleeping place. 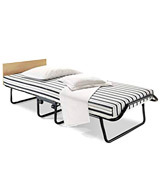 This folding bed will be of service in both situations and provide ultimate comfort. The J-Bed Double Folding Bed is a super comfortable sleeping place for your overnight guests. The JAY-BE company has designed the folding bed with care in mind since a sound sleep is a key to health and wellness. So, if you really want your guests to have a good night's sleep you should definitely consider this model. The mattress of the bed is made of 10-cm memory foam that contours your body from head to toe and allows you to fully relax on it. We should also mention that the mattress comes fitted with a durable breathable cover and it means that the mattress will be clean and serve you for ages. It is important to note that the Jay-Be folding bed is an easy-to-handle model. It takes only several seconds to fold or unfold the bed owing to the exclusive J-Lok® mechanism, and what's more it doesn't take much space when stored. The manufacturer has designed J-Bed with an anodised aluminium frame that makes the whole construction both durable and lightweight. 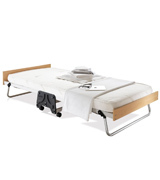 But the most outstanding thing about this folding bed is that its base is made of tough wood species. Thus, you get not only comfortable but also an orthopaedic folding bed. For your convenience, the model is equipped with casters thus, you can easily move the bed around without exterior help. This folding bed has been thoughtfully designed by the manufacturer to offer you steadiness, portability and comfort at the same time. So, on purchasing the J-Bed folding bed you're quite literally making an investment in your health ensuring that whoever's going to sleep on this bed will feel good and enjoy the comfort. Sleep deprivation is known to be the main factor causing some of the biggest disasters in history. Those workers who work at hazardous production facilities and complain about sleep problems should never forget that they are in charge of not only their own health and wellness but also thousands of other people connected to them. You surely remember (or at least heard of) the nuclear meltdown at Chernobyl in 1986, the massive Exxon Valdez oil spill in 1989, and the Space Shuttle Challenger catastrophe in 1986. All these disasters are recognised to have happened due to the designated person's sleep deprivation. The Fold-Put Guest Chair Z Bed Folding Mattress stands out from the competition rivalling other models in that it has a threefold construction, meaning it can be used not only as a sleeping bed but also as a mattress and an armchair. 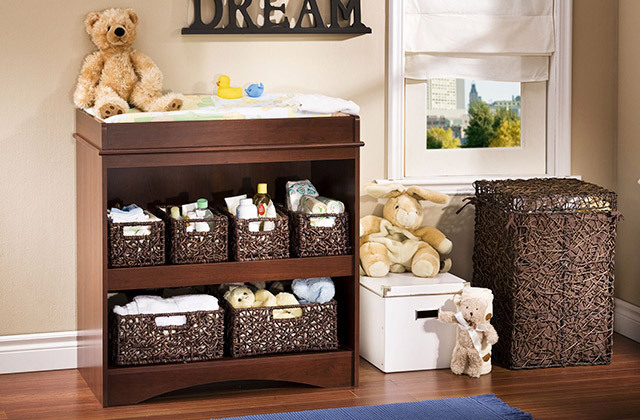 This adds a lot of appeal to it, making it especially attractive for those users who don't look for a permanent bed and need something they would be able to easily move with them or store away when so required. The Fold-Put Guest Chair Z Bed Folding Mattress consists of three parts, hence the threefold construction. 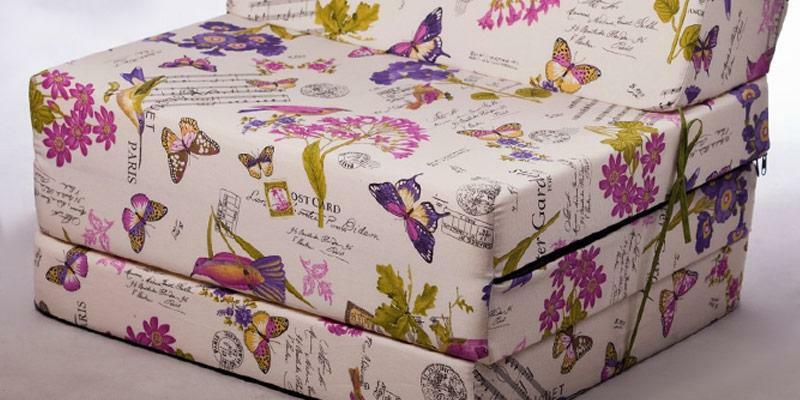 The back here is a practical bit which you can use as a cushion when converting the mattress into a folding bed. 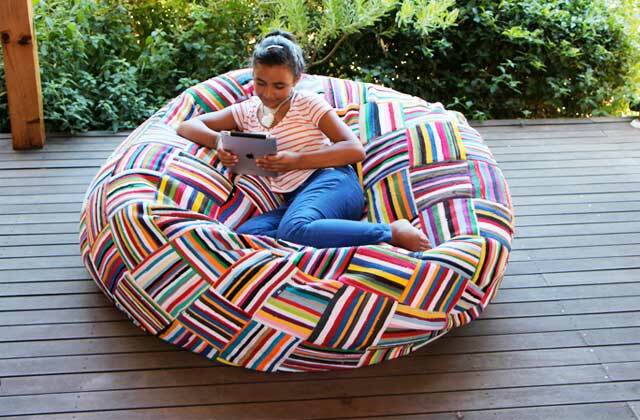 This cushion is comfortable and should fit anyone with the height no more than 200 cm, which is practically everyone. The best thing about the Fold-Put Guest Chair Z Bed Folding Mattress, besides its versatility of course, is its stylish design. It looks really modern and is available in several colour and print options, making it easier to pick one that will fit in your living room the best. The cover of the bed is high-quality. 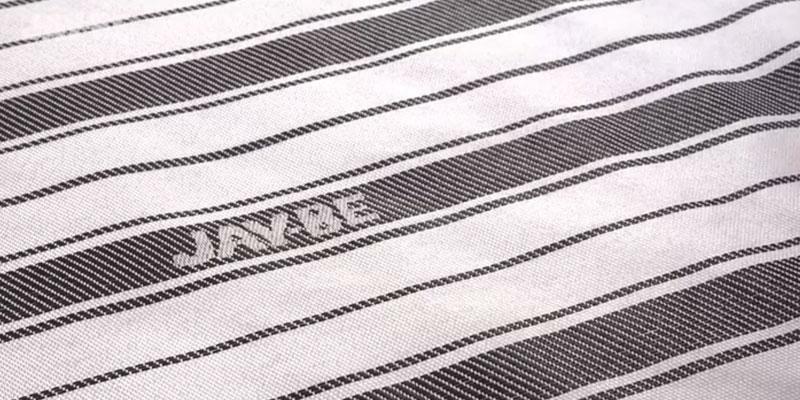 Not only is it removable and washable but also durable enough not to lose its colour after several washes. Comfort is the key aspect we need in a folding bed (and any bed, for that matter). That's why we'd like to focus on it more. High quality of the sleeping surface is hard not to notice; with a 10-cm memory foam the unit screams "luxury". However, it's not only about its looks. It's also about support and comfort. A mattress this thick ensures excellent support to your body helping to release strains and pressure knotted in your back. Also it perfectly adapts and retains its shape, despite how long or often you use it. The transformation part is also on par. 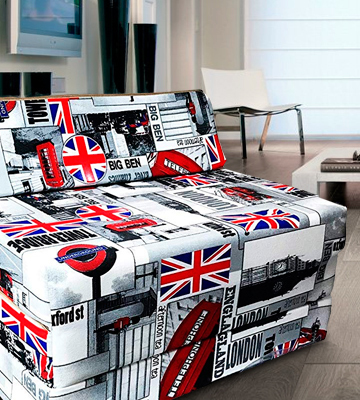 To transform it in to an armchair and vice versa, it'll take your literally seconds. It's so easy even your child could do it with a quick hand movement. The JAY-BE company is renowned as one of the best companies for folding beds and furniture manufacturing. All the goods are unique, inventive and also incredibly functional. But what is more important is that they match the criteria of high-quality and comfort and comform with British and European safety standards. The Folding Bed with Airflow Fibre Mattress is not an exception from the rule. You might find the bed rather plain in design but its main function though is to provide comfort and that's where this bed will surely pleasantly surprise you! So, what makes this bed so comfortable? 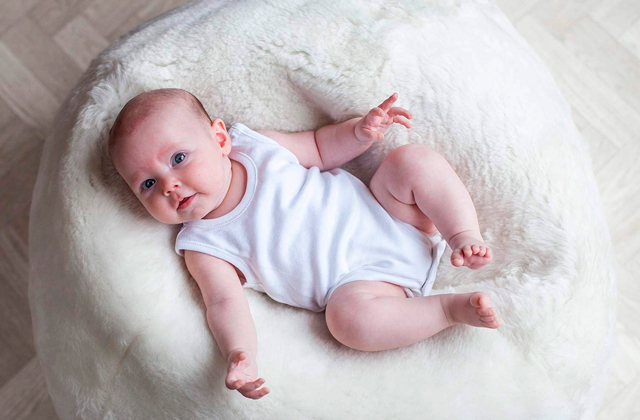 The answer is simple - a breathable fibre mattress. The medium feel mattress ensures full body support and comfort, reduces pressure points and discomfort. We may safely say that your guests will be able to wake up feeling totally refreshed after a night on the JAY-BE Value Folding Bed. The beauty about any folding bed is that it's easy to fold and unfold and it takes only a few seconds. With that in mind, the JAY-BE company released its folding bed to meet all users' requirements. At the first glance, the JAY-BE bed looks just like an ordinary folding bed but there are certain features that put it forth before the rivals. Unlike the majority of bulky beds, this one is incredibly sleek and small, yet, well balanced and stable on a smooth surface. 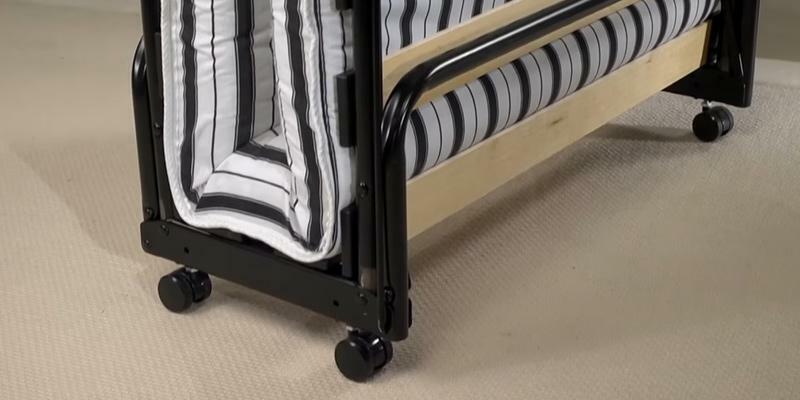 Owing to the lightweight frame, it's also very easy to roll the bed out and in for neat storage under bed or in a wardrobe. The bed is so small that you can easily fit it in a car boot and take it with you on trips. The water-resistant frame will survive different weather conditions and become your backup option wherever you need. Every person has heard about the circadian biological clock that regulates the timing of sleepiness and wakefulness periods throughout the day. This clock "winds up" owing to adrenocorticotropic hormone (ACTH), also known as corticotropin produced by our organism. Scientists claim that the increase of corticotropin level leads to unconscious feeling of stress when we wake up in the morning. If you want the included mattress to be non-fouling and serve you for many years, we'd recommend you to opt for a mattress cover. 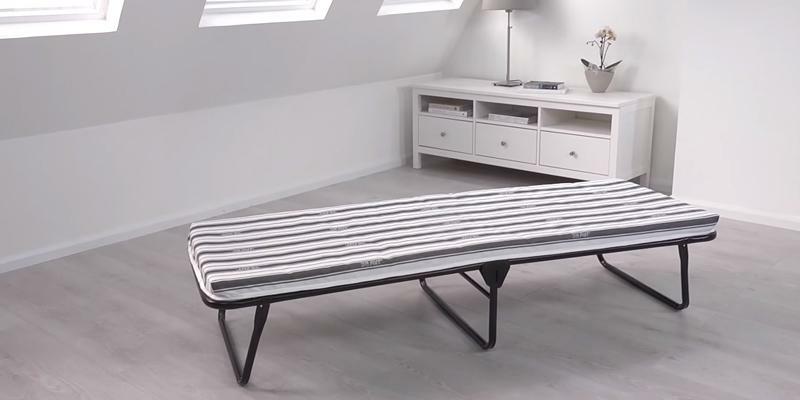 If you're on the prowl of a folding bed that would be compact in size and appealing in design, the Chatsworth Single Folding bed from the JAY-BE company might be the right one for you. It’s a high-quality folding bed that combines all the benefits of a compact bed with a touch of luxury. By “luxury” here we mean a thick pocket sprung mattress that has more than 4,000 separate springs. Those springs are fortified with topped sumptuous fillings that can adapt to the precise shape of your body to bring you a super-comfortable night sleep experience. Though this bed has a claim to work perfectly for daily use, we'd recommend treating it with care. The sprung slat base, while being rather supportive, isn't as robust as it is in traditional beds and might not hold to abuse use. So it's advised not to jump on it nor kneel too hard, if you do not want it to break quickly. 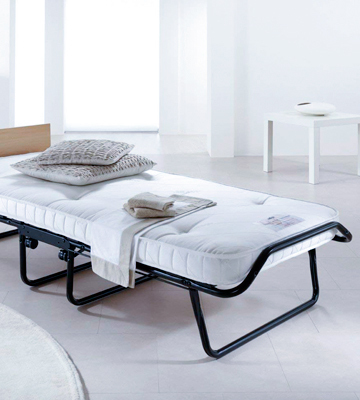 Which is the requirement common for most folding beds, not only the Chatsworth Single Folding bed. Besides that, we have very little to dislike about this folding bed. It's beautiful, compact, and comes with a mattress reducing you the extra costs. Though we'd advise against using it as a regular bed, it's certainly a good extra bed for those times when you have guests that you want to stay overnight. 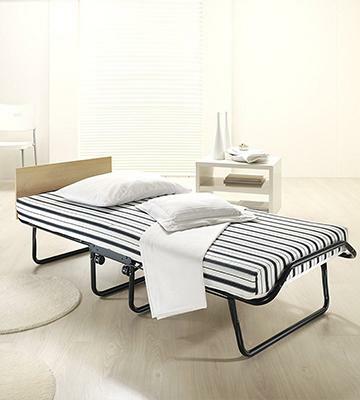 One of the biggest advantages of this folding bed is that it's very easy to put together. 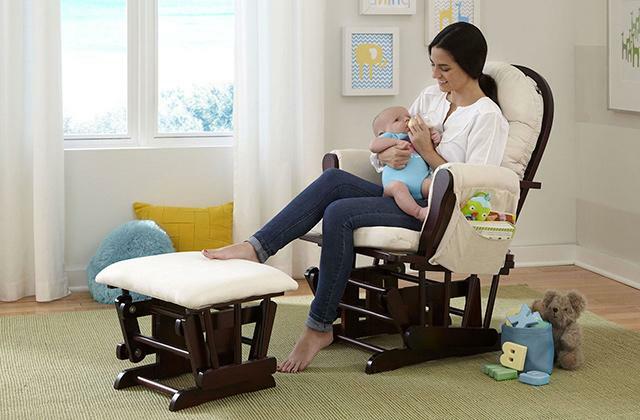 It comes pre-assembled with clear step-by-step instructions and includes all the necessary tools. The assembly requires no additional help and will take you less than 10 minutes. And it will take you even less to fold it for storage when you don't need to use the bed. 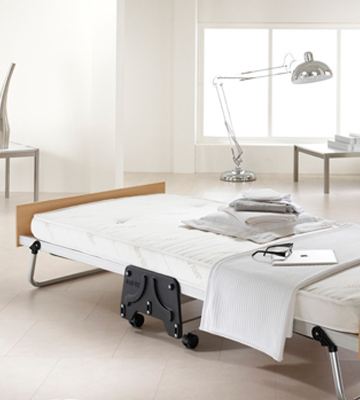 The thing we like in particular is that this bed includes 360° castors which make it easy to move it when folded. Also, the bed has fully automatic legs that open in seconds when you need to unfold the bed again. All of these things make the JAY-BE Chatsworth Single bed very convenient to use and contribute to its portability. Although we've said earlier that it's not advised to jump on this bed, the bed frame here is well-built. It has a steel frame finished in high-quality epoxy paint that makes it extremely durable, and the lifetime warranty that comes with this product stands to this point. Aside from durability, we like how this bed is designed. Its coating makes it look very classy and even expensive. It has no sharp lines or flashy patterns and will blend beautifully into any interior. It's worth mentioning that this bed is best used by people under 180cm - taller users might find it a tad short. Other than that, it's a premium product that will bring comfort to you and your guests whenever they come around. The Venus folding bed and any other bed manufactured by the JAY-BE company is a pinnacle of comfort, for sure. You may have noticed that lots of folding beds under other brands might be portable, lightweight and comfortable but still, JAY-BE furniture surpasses its counterparts in all parameters! Here, the bed features a sprung slatted base and a breathable dual density airflow fibre mattress - a combo to ensure great body support and deliver an outstanding orthopaedic effect. What we like about this bed as well is that it’s got a wide headboard to support a pillow, the feature rarely found in folding beds. This all makes this bed look so similar to a full-size bed despite its folding construction. FSC Certified, the bed by JAY-BE will become a great acquisition by any family and a comfy sleeping place for all-age guests. The Venus folding bed has been designed to ensure not only a sound sleep but also convenience of use. The folding mechanism is incredibly simple and can be handled virtually by anyone effortlessly. Due to the built-in 360° caster wheels, the bed is also pretty mobile and can be easily moved from one room to another without being folded. The sprung slatted base is under lifetime warranty and so, is very unlikely to ever get broken. Actually, this bed can be used as a permanent bed (if you for example live in a hostel room and have no enough space for a solid bed). It’s really comfortable and well-balanced, you won’t feel a difference. 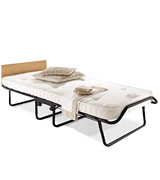 So, at a great price now you can get this bed and provide yourself with a spare overnight sleeping place for whatever needs and be sure of its quality and service life. The scientists have proved that our ancestors used to sleep on mattress-like objects back in the Neolithic period. The cover of a mattress was made of an animal skin and stuffed with leaves and herbs. We may assume that the mattresses were not so soft and comfortable as modern models but still, it was quite witty of them to make such an interesting sleeping place. We recommend buying a Jay-Be Polypropylene Folding Guest Bed Cover to protect your bed from dust and make it unnoticeable in your room. What Is a Folding Bed? A Folding Bed is a compact sized bed, usually bought for space-saving purposes. If you live in a small flat or are looking for some mobility option, then it’s definitely a must thing on a list to obtain. 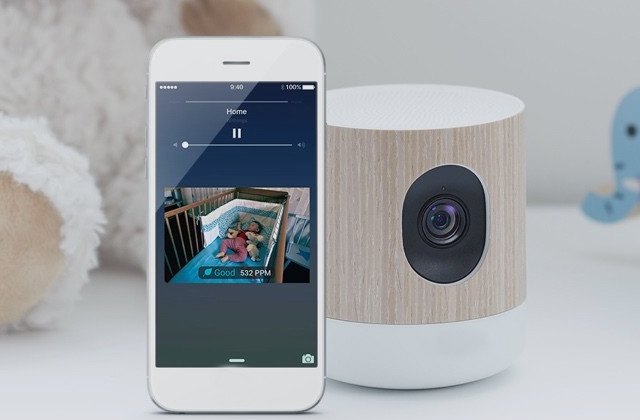 Also, they can be very useful when someone is visiting your place and staying overnight. Most folding beds are made in a way to easily collapse to a compact size unit and take very little space for storage. Yet, the sleeping surface lies on a sturdy and heavy-duty frame, designed to maintain the weight of both, a child and an adult. A Folding Bed can become a great alternative to buying a spare bed for guests and relatives who would like to stay overnight. Besides, it’s considerably cheaper than a traditional bed made of solid wood. For your folding bed, you'll surely need a combo of a good duvet and a pillow (latex or feather). If you’ve decided to purchase a Folding Bed for whatever reason, here are some of the important criteria you may want to pay attention to. What makes a bed comfortable is its sleeping surface. Consider the size of a mattress, how wide and long it is. The last thing you want is to have your legs hanging over the edge of the bed. It’s got to be capacious enough to accommodate an adult and considerably tough not to downwarp under his weight. 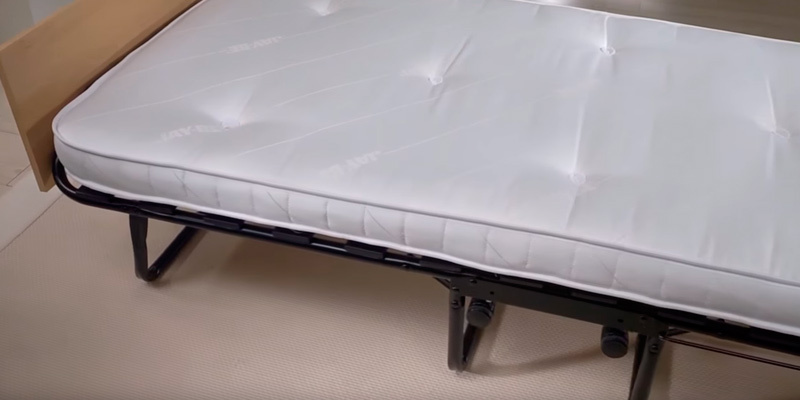 Some Folding Beds come paired with high-quality memory foam mattresses. These are the beds that can become a great inexpensive alternative to a permanent bed and an overnight “station” for unexpected guests. Others would better work as an emergency cot and outdoor equipment. This is where you need to clearly decide what’s more important for you. Generally, they are all good, but for different purposes. The other thing you should definitely take into account is the frame of the bed. It’s got to be solid, sturdy and reliable. Otherwise, you may get a wobbling bed that will not stay in place, and of course, won’t be safe. Pay attention to the material that a bed frame is made of. Not only does it predetermine its steadiness and sturdiness, it also determines how mobile and portable the bed will be. When you’ve finally found a bed that meets your requirements and provides enough space, make sure to check out its functionality, which may differ from model to model. While many folding beds can serve as simple beds only, you can also find many models transformers that can be turned from a bed to a chair or sofa. Functionality is an important aspect, especially if you need a mobile option that could be easily put together and put down when not in use. Consider the folding mechanism and the weight of the chosen model: the bed should not be too lightweight, of course, but it should not be too heavy either so you can fold it without assistance. 1. Beds Buying Guide, John Lewis. 2. Beds & Mattresses Buying Guide, Best Buy. March 07, 2014. 3. 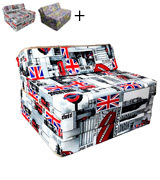 Your Guide to Choosing a Comfortable Fold-out Bed, eBay. October 30, 2013. 4. Ben Slater Types of bed, Which? 5. Fred Albert Smart Shopper: How to Choose a Sofa Bed, Houzz. October 22, 2015. 6. Experience the Convenience of a Foldable Bed, HipVan. November 08, 2013. 7. Debra Taylor Types of Folding Rollaway Beds, eHow. 8. How to Choose a Good Camping Bed, HealthStatus.